Enjoy amazing comfort enhanced with a custom-like fit in womens Fisherman sandals. 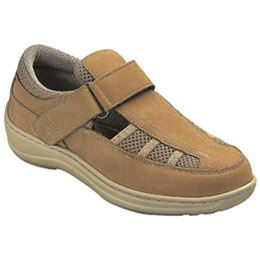 Orthofeet Fisherman sandals are crafted with advanced athletic and therapeutic shoe detailing to offer relief for heel-pain, arch-pain and forefoot discomfort along with unsurpassed comfort and protection for sensitive feet such as diabetic or arthritic feet. Unique orthotic support, seamless lining, extra room and Ergonomic StrideTM sole make every step you take soothing with comfort. -Soft, seam-free lining design with extra foam padding offers unsurpassed comfort and protection. -Ortho-Step orthotic insole, designed with anatomical arch support and deep heel-seat provides customized support and unsurpassed shock absorption. It offers relief for heel pain and foot discomfort, making every step you take soothing with comfort. -Extra-depth design along with soft, non-binding leather upper ease pressure on the foot, offering a roomy fit and freedom for toe movement. -Lightweight cushioning sole with Ergonomic-StrideTM design soften your step, and helps propel the foot forward. -Two sets of removable spacers (1/16 and 1/8 thick) allow the adjustment of the space inside the shoe for a perfect fit.